Merry Christmas Eve everyone! 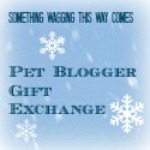 I was a little late signing up for the Pet Blogger Gift Exchange, but when I heard about it I knew I wanted to join. This event is hosted by Something Wagging This Way Comes and allows pet bloggers to connect with each other, make new friends, and find new blogs. I was hoping to be paired with a blog that I had never heard of before and my wish was granted. Since I was paired up with another blog a little late this month, I wanted to get to know it a little better before I wrote my post about it. I was paired up with a blog called "DogDaz". DogDaz is about a zoo mom and her zoo crew. I don't know the author's real name yet, so I will call her the Zoo Mom! She currently shares her home with five pets - 2 dogs and 3 cats and has cared for many other pets in the past as well, including some guinea pigs. Let me introduce you to the DogDaz zoo crew. First, there is Louise aka "Lulu Belle". She's a 2 1/2 year old hound & lab mix. Next, we have Sofie Bear. Sofie Bear is a Welsh Corgi & Shetland Sheepdog mix. She's 1 1/2 years old. 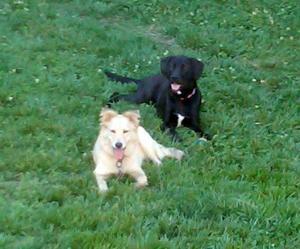 Both of these cute dogs were rescues. The Zoo Mom also has 3 cats. Noel is 6 year old girl cat. She is also a rescued pet. 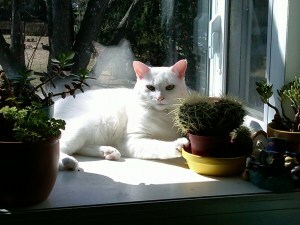 Noel was a very sickly kitten with feline herpes when adopted, but her mom was able to nurse her back to good health. Now Noel is the leader of the zoo. 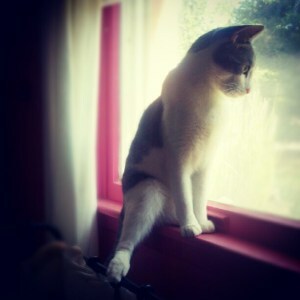 Nine is an adorably young gray and white tabby. He is quite the mancat mischief maker in the zoo and loves to go on adventures. Last is Stella. 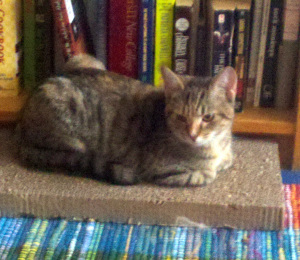 She has some really lovely markings that I might describe as a tortie or calico tabby cat. She was adopted at the same time as Nine, but unlike her adopted brother, she is very quiet and calm. The DogDaz blog offers a little bit of everything to its followers with several posts a day sometimes. Zoo Mom has shared the stories and antics of her zoo for a little over a year now. She recently started joining in on several pet blog hops. If you need a good smile or laugh, you are sure to find one at DogDaz, as cute pictures and memes are posted regularly. The blog is definitely a great pick-me-up if you're feeling down. When I first visited DogDaz, I was quite saddened to read that 2 of the zoo's cats had crossed the rainbow bridge within days of each other a little earlier this month. Both of their stories were very sad, and I send my condolences to the Zoo Mom and her family. Losing one pet is hard enough, but two so close together is even harder. RIP to Muffin Man and Constance Kitty from the DogDaz zoo. I can't wait to see what adventures the DogDaz zoo has in store for the future! If this is your first time hearing of this blog, I recommend that you go and visit! DogDaz also has a Facebook page that you can go and "like". Click HERE to visit DogDaz! All pictures are from the DogDaz blog! I'll be visiting them right nows!! Yay Cotton! Merry Christmas Eve to you too! Thank you so much sweet Molly, you too! Good Gizmo, I know you will enjoy your visit! Thank you for the Christmas wishes! DogDaz is awesome. They start off our morning with a smile every day! Aww how sweet! Thanks for stopping by Miss Cupcake! we follow DogDaz too and love them! They are a very awesome bunch. It is a pleasure to be paired up with them! It's actually the linky for Pamela Webster's Something Wagging. She has it set up for the people who joined the gift exchange. Glad to hear you already follow DogDaz! I never heard of DogDaz - are you in the BlogPaws community because you sound familiar. I am glad to find you and thanks to Pamela, to connecting! Hi Carol, if you are asking me if I am in the BlogPaws community yes I am. I am not sure about DogDaz though. I did enter my dog in your Fidose of Reality holidawg photo contest earlier this month! Thanks for stopping by and reading about DogDaz! Thank you and am very glad to be your new friend! We love the DDZoo crew. You gave them quite a gift by sharing their story. We were unaware of their recent losses, we will send our condolences. What a nice job introducing the Zoo Crew at Dog Daz, Ann! Love how you included so many pictures in your post, too. Thank you for hosting it Pamela! It was a lot of fun and such a wonderful idea!